The NewStar adapter, model: FPMA-VESAMAC, provides you with an Apple iMac screen with a VESA hole pattern. 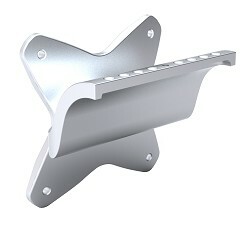 By using a VESA pattern you an iMac to a NewStar desk or wall mount bracket. The Mac adapter has the VESA hole pattern: 75x75. How does it work? Remove the base of your Apple iMac. Mount the adapter on the back of your screen and install the desired NewStar wall- or desk mount to your screen. This adapter offers a VESA hole pattern 75x75. Any mount with VESA75 can be combined with it. Look on our website for your desired support. This adapter is made of durable high quality metal.